Living in New York City, I don't drive very much these days. I still like a hot car and I love driving, especially on the vast and sometimes 80 mph speed limit Texas highways I grew up on. Is it fast? I'm in. Does it look cool? Done. Does it make me look even cooler? Even better. 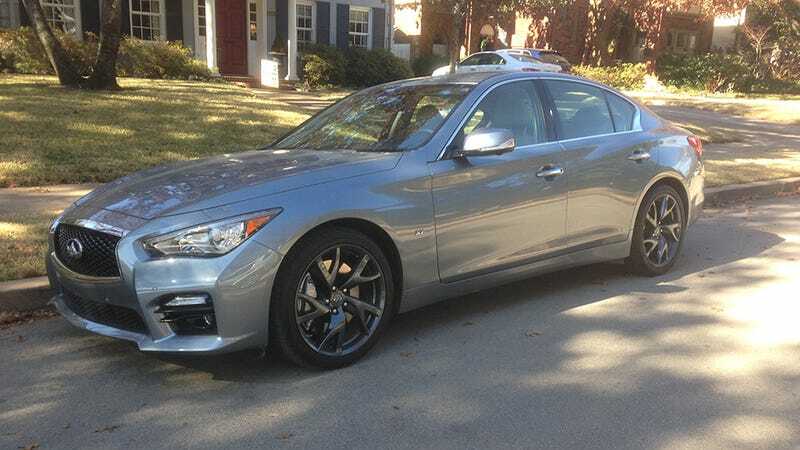 But the reason the 2014 Infiniti Q50s floored me had nothing to do with my normal criteria. It's not that the Q50 isn't a looker. That's just not the marquee feature. The Q50 is all about a crazy steering tech that's new to cars (although more common in planes and spacecrafts). And I didn't even understand what it was until I gave 'er a spin. So what is it? The concept is called drive-by-wire steering, and the Q50 is the world's first production car to incorporate it standard. Maybe those words mean nothing to you, and I would say it's worth actually driving the Q50s to fully grasp the definition. But basically, instead of a metal shaft running from the steering wheel to the front suspension, the Q50 uses electronics to relay your steering wheel input to the tires. That might sound dangerous, given the relative reliability of electronics. But don't fret; if the electronic system fails, a mechanical backup snaps into place. The rest of the time, though, the only thing connecting the steering wheel to the road is electrons. What's the benefit? Since software is running the show, it's easier to switch between steering styles. So with the flip of a little switch on the console, you can swap between sport, standard, eco, snow, or custom modes. It took me a while to actually work up the courage to switch from standard mode to something else. I dunno, driving a $40,000 car that didn't belong to me? I guess I thought something might explode and kill me. Also, less than a half a dozen Q50s have been recalled for a failure in the steering system when it gets too cold, but that's neither here nor there. When I actually came around to it, the change was always seamless. The car would automagically go from feeling like a nice sedan to a speedy little sports car with a tighter, stronger, and decidedly different steering style. There was a slight jerk that signified you had made an adjustment, but it wasn't anything too terribly dramatic. Also, I thought using the switch would take a modicum of skill, but it was actually a perfect match to my timidity—and in fact it probably resulted in making me a bit bolder of a driver. Thanks, technology! Of course I used sport mode a lot; it was the most fun, and the gas pedal response time seemed to be the fastest. But on the highway, I also liked using eco mode. It was smooth and easy to coast along, and the wheel felt a little bit looser when I made turns. The one I didn't get a chance to try out was snow mode. I am in Texas, and although snow has been known to make cameo appearances here, it was M.I.A. during my rendezvous with the Q50S. It's not just academically interesting that a flip of a switch can readily adjust features like engine output and steering response; it's fun. I don't know if drive-by-wire steering alone is enough of a hook to make me actually buy this car. I found myself sort of forgetting that I even could switch between modes. But whether drive-by-wire would be enough to make me buy this specific car isn't really the point. The Q50 is most interesting as a glimpse at the future of how we'll drive, one in which drive-by-wire isn't a curiosity but a given. I can report with conviction that the future is fast, and it is fun.